Traditions and Encounters © 2017 UPDATED AP edition (Bentley) will be available in January 2016! 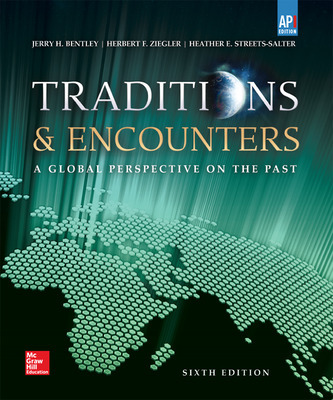 Traditions and Encounters new Advanced Placement edition offers an inclusive vision of the global past—one that is meaningful and appropriate for the interdependent world of contemporary times. Through new and revised chapter-level and part-level features, the hallmark twin themes of traditions and encounters emerge in greater clarity than ever before. Integrated AP features and primary documents enhance the learning experience. AP-style Test Practice questions at the end of each chapter to enrich learning. AP Themes-based Part Openers illustrate themes in context and help students connect themes across time. AP Chapter Focus features in Chapter Opener spreads highlight the vital content for AP Exam success. Newly revised AP Teacher Manual and AP Test Banks. Access more than 600 primary sources in the online Primary Source Investigator, including pre-set AP World History Document Based Questions.